Even if you may have heard by now about African black soap, it may still may be unclear to you what it really is. What is the African black soap? The truth about black soap: real or hype? The African black soap, also known as “black soap” is a type of soap that is originating in West Africa. It’s also known as nhca nkota, sabulun salo or ose dudu. This type of soap is made from the ash of African plants which give its specific dark colors. The plants are harvested in Africa and the black soap has become quite a popular toiletry product all over North American. In Ghana, for instance, black soap is made by women and fair-traded on a regular basis. The recipe isn’t known exactly by the public and the recipes have been circulated only within the community for many generations now. The process is very interesting and begins with the sun-drying of the plant matter. Palm tree leaves, plantain skins, shea tree bark and cocoda pods are used for burning. Some oils, fats and water are going to be added later on. Shea butter, palm oil and coconut oil are cooked together and the mixture is well hand-stirred for 24 hours straight. The soap is going to “cure” once the cooking is done. The black soap has been used by women in West Africa for centuries now and it’s a reliable solution for cleansing your skin. despite its name, a good African black soap is supposed to be rather brown and not black. As a matter of fact, a black soap may contain artificial ingredients which give the black color. The black soap is great for many things, from reducing the appearance of blemishes to healing skin wounds. It’s a soap that has anti-inflammatory and anti-bacterial abilities and its multiple benefits recommend it for many. It also helps you heal insect bites or moisturize the skin. it makes the stretch mark less noticeable and soothes sunburns. This type of soap typically contains a lot of cocoa, which also contains caffeine. This may lead to excessive energy. Poor concentration, irritability and nervousness may be some of the side effects that you’re going to experience when using the African black soap. Even if it’s not common for people to develop allergy reactions to the African black soap, the risk isn’t entirely null. You may have allergy to plantain or cocoa and you may not even know about it. You may also develop an allergy reaction from using the black soap the wrong way. As it’s formulated with raw ingredients, the African black soap works best as an exfoliator. This can only mean one thing: you shouldn’t use it daily, but only 2-3 times a week. Using it every single day is going to lead to an unpleasant reaction on your skin, from breakouts to annoying itchiness. Many experts out there think that the cocoa within the formula is the main cause for various gastric problems, stomach pains and even constipation. Women that are still breastfeeding should stay on the safe side and not using it all. The African black soap may lead to colic to the baby and that’re related to gastrointestinal problems. Long story short, even if the African black soap doesn’t hold the key to all skin conditions, it’s still formulated with ingredients that are good for cleansing the skin, lessening the visibility of blemishes or evening your skin tone. Skin reacts differently so a patch test on a smaller area of your skin is always a wise thing to do. After all, you want to solve a skin condition, not end up struggling with a bigger one. This ingredient is quite common for the African black soap. It’s loaded with antioxidants, hence its use. It contains toctrienol and tocopherols, which are in fact forms of vitamin E. This is why one of the benefits of African black soap is related to treating acne and eczema. Palm oil also includes carotene, therefore the palm oil is highly efficient for minimizing the cell damage that outer stressors and aggressors (environmental pollution) cause to the skin. The African black soap typically contains cocoa butter, which is a natural fat that is obtained from the cacao bean. This ingredient is great for moisturizing the skin and soaks right into the skin. It’s also a great agent to use for addressing dermatitis and eczema. Obtained from the fruit seeds of the African palm tree, the palm kernel oil is a common ingredient within the African black soap’s formula. It improves the lather of the soap and its hardness too. It’s high in lauric acid and it’s strong enough to kill viruses, fungus and bacteria. It has similar properties and even nature with coconut oil. If you’re wondering what gives the black soap its specific color, well the answer is simple: it’s a form of potash, potassium hydroxide that comes from the ashes of plantain skins, shea tree bark, and cocoa poad. It’s a by-product of shea production. Shea butter, aka “karite butter” is made from the nuts of karite tree and it’s an important ingredient of the African black soap. Shea butter is known for its ability to heal scars and burns, but also to treat psoriasis, dermatitis or scars. You can also use it for stretch marks and for removing dandruff. It’s a reliable ingredient that reduces the appearance of wrinkles as it moisturizes the skin and sustains cell renewal by improving circulation. It also includes cinnamic acid, protecting the skin from the damaging UV rays. Plantains are quite rich in essential nutrients and oils. They’re loaded with vitamins A and E, which are always good for the skin. As it’s an organic, raw and unprocessed soap (or, at least, that’s how it’s supposed to be), the African black soap should come with some fine particles of vegetative matter inside. Not only this is the best way to know for sure that your soap is genuine, but the grainy texture is going to turn the soap into a reliable and gentle exfoliator too. One great part about the African black soap is that it works for oily, dry and combination skin altogether. As it’s formulated with coconut oil, the African black soap is able to reduce dryness and hydrate the skin at the same time. It moisturizes well the skin and keeps the oil production under control, benefitting the oily skin as well. All soaps should cleanse the skin and the African black soap doesn’t make an exception. As a matter of fact, it’s quite an effective topical cleanser and that’s because the lauric acid from the palm kernel oil. The coconut oil gives the soap a nice lather and the soap has antimicrobial abilities too. It moisturizes as it’s made with shea butter and cleanse your skin without stripping it down from the natural oils. Due to its cleansing and antimicrobial properties, the African black soap stands out as a great helper when fighting acne. Coconut oil keeps acne at bay as it contains caprylic acid, capric acid and vitamin E. all of these ingredients control the skin’s pH level, calming the irritated and inflamed skin. Palm oil heals acne breakouts and reduce the risk for developing acne as it’s loaded with oleic acid, beta carotene and linoleic acid. They all present anti-inflammatory abilities, creating a protective barrier for the skin. The soap moisturizes the skin and the vitamin A within the formula improves the health of your skin. Inflammation, sun damage, acne and various skin injuries are the main causes for the hyperpigmentation (darkening of an area of your skin). cocoa pods are able to block the activity of tyrosinase, the enzyme that controls the melanin. And melanin is what gives the color of your skin. once the tyrosinase is not functioning right, the melanin production may increase without control, resulting in dark patches, liver spots or discolored skin. Additionally, the cocoa pods may even naturally absorb UV light, protecting your skin from the sun damage that gives the dark spots. The cocoa pods and plantain peels contain antioxidants that reduce the visibility of fine lines and wrinkles. The African black soap is efficiently fighting the free radical damage that translates into the fine lines and wrinkles. The one-of-a-kind combination of ingredients within the formula of the African black soap makes this type of soap reliable for making stretch marks, acne scars and skin wound look less noticeable. Shea butter repairs the skin tissue, but also improves the collagen production. The essential fatty acids in palm kernel oil, coconut oil and red palm oil boost the regeneration of the skin cells, making the scars more difficult to notice. Let’s not forget the red palm oil which contains vitamin E, a fundamental ingredient for a healthier skin. If you’re shampooing too often or use too many styling products, it’s only a matter of time until you’re going to have to deal with dermatitis that leads to flaky dandruff on your scalp. You may use the African black soap for clarifying the scalp. If your hair is oily, use only a small amount of the soap with some water and leave the mixture on your scalp for 10 minutes or so. If your hair is dry or normal, add a conditioning oil (extra virgin olive oil, coconut oil, shea butter) and massage it into the scalp. Don’t forget to rinse it away as the African black soap is quite strong. You should also use apple cider vinegar for detangling and softening your hair afterwards. The African black soap seems to be working against multiple strains of fungus and you can successfully use it when treating nail fungus, ringworm, athlete’s foot, “jock itch” or candida overgrowth. You may even use it against hosehold mold. If you’re dealing with sensitive, red, itchy and sensitive skin, chances are you’re in fact dealing with eczema. The artificial chemicals may irritate the skin and the African black soap doesn’t contain any. As a matter of fact, it’s loaded with ingredients that moisture the epidermis and reduce inflammation of the skin. Shea butter, coconut oil and red palm oil hydrate the skin on deep level, calming the swollen skin and bringing comfort during an eczema flare-up. Squeezing or breaking the pimples, touching our skin with dirty hands is going to lead to dark spots on skin which are quite difficult to get rid of. You should keep in mind not to touch your pimples and try to stay away from the anti-spot removal creams as they’re loaded with chemical ingredients. Don’t hesitate to talk to a dermatologist and see if the African black soap is a wise solution for you. As long as you’re using it right and follow a proper skin care routine religiously, you’re going to be able to see results from 3 weeks to 60 days. Skin reacts differently so take then under consideration when trying to clear the skin from dark spots with African black soap. 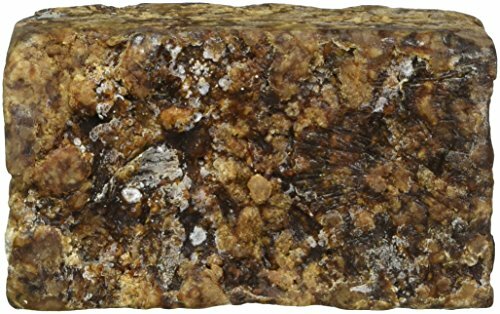 The raw African black soap is highly praised for its nourishing abilities and it’s the high concentration of antioxidants behind its performances. A raw African black soap is made from cocoa pod, palm leaves, ashes of plantain skin, palm oil from kernel or leaves. Shea butter or other ingredients may be included within the formula, for softening the skin and moisturize better the skin. Due to the antioxidants within the formula, the raw African black soap protects your skin from the damage of free radicals, making the fine lines and wrinkles look smaller. It also tones the skin, improving its texture and leaving it radiant and suppler. The raw African black soap is also making discolorations and brown spots less noticeable, evening out your skin tone. It reduces inflammation and irritation in skin, comforting the dry and irritated skin. The ashes in the raw African black soap exfoliate the skin, eliminating the dead skin cells and leaving your skin younger and healthier looking. It has anti-fungal and anti-bacterial properties, making it as a solid option for removing makeup. A good example of raw African black skin is the African Black Soap Raw Organic Natural Pure. Made with plantain skins, shea butter, palm oil, water, glycerin and kernel oil, the soap is natural and has no synthetic by products. You may confidently use it for keeping acne at distance or for reducing the appearance of acne scars. It works on dry skin and it’s gentle enough to be uses as a reliable exfoliator. It may bring comfort in various skin conditions due to its high concentration of minerals and vitamins. Vitamin A, E and iron are within the formula so the soap exfoliates the skin, cleansing it very well. It makes discoloration more difficult to observes and fades out fine lines and wrinkles. It softens and moisturizes the skin, giving it a healthy radiance. The soap is firm and soft, maintaining its shape. It comes in different hues and shape as it’s raw. It doesn’t have a strong smell and you only need a bit of it. Pay attention to your skin, especially when using it as exfoliator. As much as you’re focusing on the goods, you should give it a try for its many benefits on skin. As you may already know by now, the African black soap is great for keeping acne at bay and making the acne scars less visible as well. 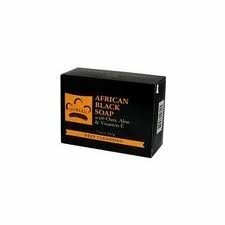 One of the African black soaps out there that you could use when treating acne is Organic African Black Soap (16oz block) – Authentic from Ghana with Cocoa, Shea Butter & Aloe. The soap is organic and it’s not going to help you fight acne, but dermatitis, psoriasis or rashes too. It’s gentle enough to use on sensitive skin and it’s fragrance-free. Its formula doesn’t include any additives or parabens, which explains its safe use on most delicate skin. The formula includes virgin coconut oil, organic unrefined shea butter and several ingredients that moisturize and calm a damaged skin. The soap is also going to help you for getting a clearer and younger looking skin as it reduces the blemishes, fine lines and wrinkles. It has anti-bacterial abilities and fights against fungus too. Safe to use on both oily and dry skin, the soap is good for controlling the sebum production and removing the dead skin cells. It cleanses the skin and moisturizes it too. It has a subtle smell and lathers very nice. On top of everything else, the soap is fair trade and vegan friendly. Long story short, the soap is great for putting acne under control and so much more. All African black soaps out there are good to use when addressing eczema but if you don’t know which way to go, don’t hesitate and take a look at the Nubian Heritage/Sundial Creations African Black Soap with Shea Butter Oats and Aloe for Deep Cleansing. Made with an old recipe, the soap contains shea butter which doesn’t just hydrate the skin, but also treats various skin conditions. The soap is gentle and exfoliates the skin, leaving it shinier and healthier. You can confidently use it when addressing eczema. The formula includes aloe, vitamin E and oats, but also tamarind extract, palm ash, plantain peel and tar. It eliminates acne and calms the skin in eczema, psoriasis or other skin issues. The small pieces of oats exfoliate gently the skin, for a good cleansing of your skin. The smell is pretty amazing and the soap is going to get you good for a nice amount of time. It leaves your skin smooth and healthy too. Having said that, for the performance and good formula, don’t hesitate to give the soap a try for soothing your skin in eczema and more. African black soap is safe to use on all skin types, dry, oily and combination skin alike. Some are going to find this kind of soap moisturizing, whereas some are going to find it a bit drying. Skin reacts differently and the African black soap is no exception. However, most of the time, the African black soap has more benefits than side and unpleasant effects. From the plantain skin to the cocoa pods and palm kernel oil the recipes out there are pretty various. Batches are various so one time the African black soap may work out just fine for your skin, whereas sometimes it may lead to an unpleasant reaction in the skin. You shouldn’t be surprised if your skin is going to get a bit dry or tight in the beginning, even if your skin is oily. This effect is going to go away after a week and it’s taking the soap several days until your skin’s pH levels balance out. The African black soap may lead to a burning sensation and even tingling, turning your skin red. This is why you should stay on the safe side and run a patch test on a party of your body. Let’s see how the main types of skin react to African black soap and how to get the best out of it on your skin. In some cases, the African black soap is going to dry out the skin even more in the beginning. If the formula includes shea butter or any other moisturizing ingredient, the soap is going to work better for your dry skin. If you’re experiencing dryer skin, you can always use the soap less often. A little goes a long way and using too much of it is definitely going to dry out your skin. You should use the African black soap only once a day. Keep in mind to follow it with a good moisturizer or a hydrating oil/serum, especially during the cold weather when the skin tends to be drier. Even if your skin is oily, you should use a moisturizer afterwards. A non-comedogenic lotion or oil (coconut oil or sweet almond oil) are good choices. When you’re using raw African black soap, you should take it apart and turn it into a ball, without any jagged edges. Rub it between your hands until you get a good lather. Do it gently when you apply it directly to the skin as the small particles may break your skin. You may reduce the risk for stinging and redness by washing and rinsing with cool water, staying away from your eyes. Don’t leave the soap on your skin for a long time, especially if your skin is sensitive or very reactive. You may also notice a burning sensation, burning or tingling if you’re applying it on some open sores, cuts or acne areas. Don’t use too much of it as a little goes a long way. Don’t scrub hard when you’re using the African black soap for exfoliating your skin. don’t rub the skin with raw black soap, especially on face. Lather the soap in your hands, before applying it on your face. The ash granules and debris may need a bit more time to dissolve and you don’t want to damage your skin. You may dissolve the African black soap in some purified water, using it as an effective body wash. Give it some time until it soaks. Even if purified water isn’t mandatory, it’s going to work better than tap water. The last one contains more chlorine so it may not work that great with the black soap. Add some brown or white sugar to it and make a nice scrub for your body. You can use the granules from the bottom as exfoliator, when using liquid black soap. Make sure you get rid of any sharp particles before making the scrub. Another thing to keep in mind when using African black soap is how you store. As it contains glycerin which absorbs moisture from the air, the soap may slowly start to disintegrate when left out in the open. It also absorbs water so you don’t want to leave it in a puddle when you’re done with it. Keep the soap dry and place it on a wooden soap dish with several slats, so it drains efficiently. 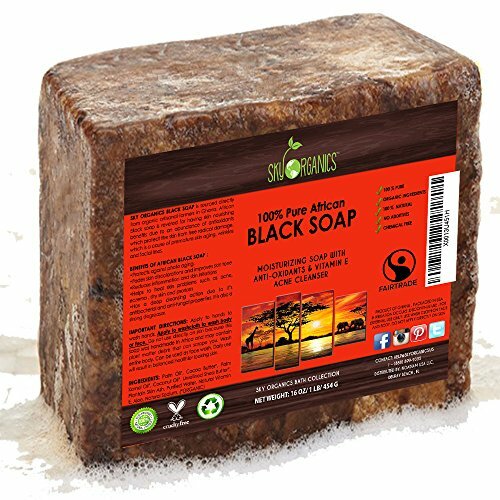 Exposing the African black soap may lead to a white film coating the soap. It’s not mold so you don’t need to remove it. By contrary, you may roll it into tiny balls and store them in a Ziploc bag, for easier use later on. If you got yourself a bulk of African black soap, it’s better to cut off a part and store away the rest of it, in a cool and dry place. Store it wrapped in a plastic and a Ziploc bag too. 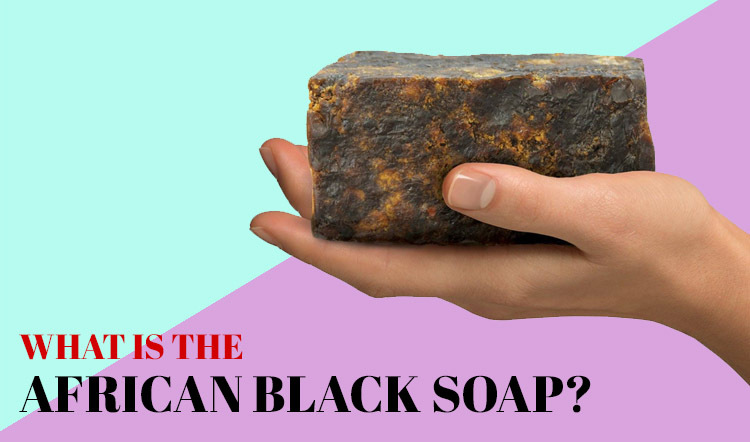 Praised for its ability to remove acne, hyperpigmentation, eczema and black spots, the African black soap seems quite the perfect soap out there to use for various skin conditions. We all tend to take it with a grain of salt, so checking some testimonies is going to help you see the results and decide if the African black soap is worth the try or not. 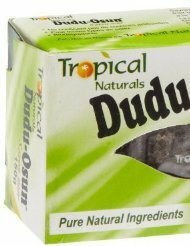 The soap used was Dudu Osun Black Soap and it’s quite a popular black soap out there. As you can see, the soap leads to quite some transformation of the skin. If you’re going to use the African black soap for some sprinkles of pimples on cheeks, you’re going to be able to heal the acne and clear the skin in less than 1 year. However, you’re going to start noticing improvements after only 3 weeks of use. It’s not impossible for the black soap to dry out your skin, especially in the beginning. Your skin may feel still rough after the first week, but you should expect improvements after 3 weeks of use. Don’t use other facial cleanser while using the African black soap. You don’t want to cause any serious chemical reactions from the combination. Don’t forget to moisturize your skin after each use of the soap.